"A Mother's Love" is a pin designed by artist Jan Hinton of Art To Wear of Modesto, California. 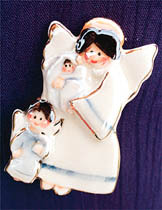 Commissioned by the mother of Gina, Shaun and Joshua, the company designed the pin featuring a mother wearing a white gown and holding a baby, with a second young child near her leg. Made of ceramic clay, like the rest of the company's line, the pin is outlined in 22-karat gold. The company was so touched just hearing the story of these three young people that they decided to include the pin in their 1999 line. And the best part, the proceeds from the sale of the pin were donated, in Gina, Shaun and Joshua's memory, to the Modesto Women's Haven House in Modesto. In 2001 Art To Wear released the rights of "A Mother's Love" to the non-profit, Remembering the True Victims, for use as their logo. This non-profit was started by Gina, Shaun and Joshua's family to advocate for crime victims and share the effects that the impact of crime has on society.